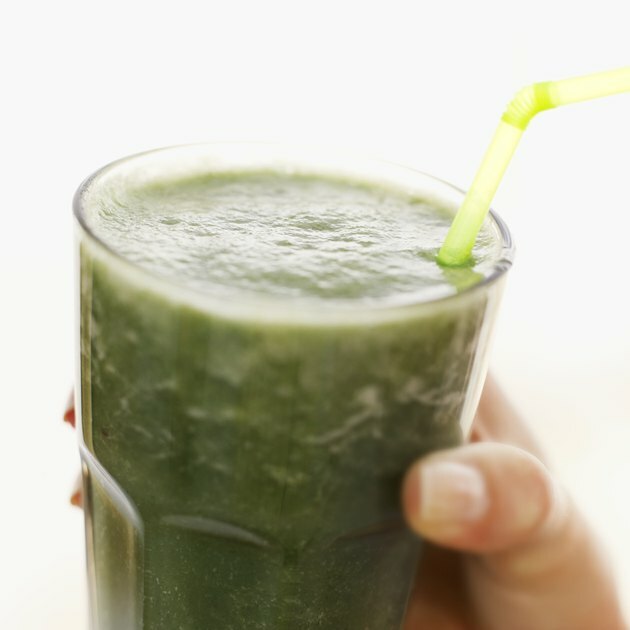 Both chlorella and spirulina are freshwater algae -- seaweed -- that are rich in chlorophyll. These tiny algae species are used as a food supplement for the array of health-boosting nutrients they contain. Chlorella and spirulina differ in the type of pigment or coloring compounds they contain. As its name suggests, chlorella is rich in the green pigment chlorophyll. This pigment gives green plants their color and is a powerful antioxidant that helps to cleanse the liver and digestive tract of toxins and reduces harmful cholesterol levels. According to the American Cancer Society, chlorella contains 3 percent to 5 percent chlorophyll, the highest amount in any microalgae and significantly more than green land vegetables. Spirulina contains a rare blue pigment called phycocyanin. The Alive website notes that this pigment is a potent antioxidant that helps to protect cells from damage. This blue-green algae is also rich in B-complex vitamins, vitamin E, zinc, copper, selenium, iron, essential fatty acids and other nutrients. Taking spirulina food supplements may help boost your immune system and help reduce the risk of allergic reactions, but more clinical research is needed on these benefits. The dosages for spirulina and chlorella are similar, and they are both available in tablet, liquid extract and powder form. The University of Maryland Medical Center recommends a standard dosage of 500 milligrams of spirulina per day. Ensure that you purchase pure quality spirulina and chorella because they can absorb toxins from their environment. If you are pregnant or breast-feeding, do not use algae food supplements without consulting your doctor. Both of these algae food supplements can be used in smoothies and juices or sprinkled on a salad. Heating or cooking dried or liquid algae supplements will break down nutrients. Add a heaping teaspoon of powdered spirulina or chlorella or 5 milliliters of liquid extract to a glass of fruit or vegetable smoothie. You can also take these algae supplements on their own. If you would like to try both spirulina and chlorella, use each one on alternate days or add a half dosage of each to your drink or food.